Day two of the U20 championships hosted by Indiana University provided more highlights by competitors who represented their high school, collegiate ranks, or themselves. One such athlete was US #1 John Meyer, a recent Lockport HS grad, who decided to take on the best overall competition he could find. Meyer will be a Unversity of Michigan Wolverine got the jump facing future titans such as Adrian Piperi of University of Texas and Jordan West of the University of Tennessee. Both competitors were among the elite high schoolers of 2017 and had outstanding freshmen campaign this past spring. Piperi and West in succession welcomed Meyer to the big leagues with first attempt monster throws of 69-4.75 and 69-0.75. It is not certain if Meyer was rattled or not but his initial effort only sailed 61-7.75. Meyer would go through trial and error sitting in 5th place until his final round toss of 66-1 bolting him into 3rd place. Meyer would not make the world junior team but he appeared satisfied with the effort even if it means losing his top-ranked high school mark to Tyson Jones of Arizona. 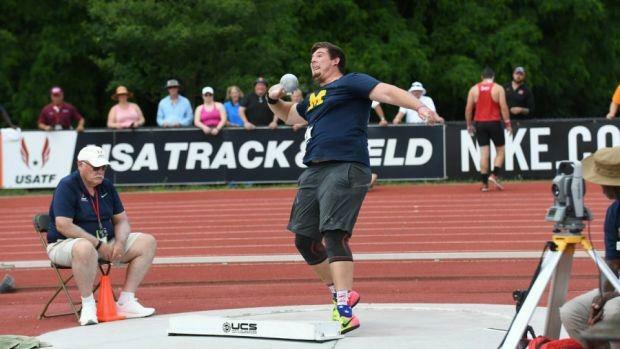 Jones opted to compete at the New Balance Outdoor Nationals where he won with a toss of 70-1.